On 1 March Arsenal had a game away to Millwall Athletic which Arsenal duly won 3-0 in front of 14,000 – a good crowd for Millwall. Tottenham’s ground was obviously still not released from military use, as they continued to play their home games at Highbury (except when playing against Arsenal when they shifted to Clapton Orient’s ground). 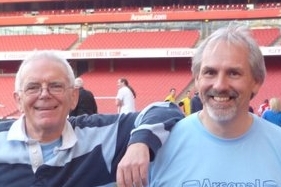 The Highbury pitch continued to be described as unplayable. Meanwhile discontent in the military continued as on 4/5 March troops from the Canadian Expeditionary Force who were expecting to be returned to Canada, began to mutiny in what became known as the “Kinmel Park” riots. Five of the military troops were shot, 28 injured and 25 convicted of mutiny. The war had been over for four months, and the men wanted to go back home. Discipline was breaking down, and everyone wanted military conscripts disbanded as fast as possible. 8 March saw Arsenal’s next home game: an easy 5-0 win at home to Fulham, celebrated by 22,000 in the crowd – an enormous increase on the wartime crowd. Meanwhile there were reports of West Ham adopting a singularly active campaign to be elected to the second division, by canvassing votes in Manchester in a way that we now associate more with Fifa meetings. It is said that South Shields FC did the same but as for the Arsenal, and indeed the other teams there is no record that anyone from Arsenal FC spent the week-end this way. 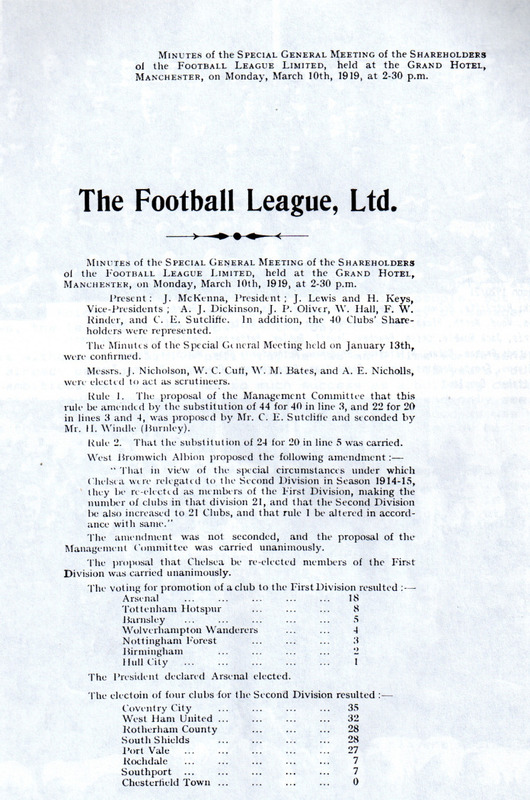 And so we come to 10 March at which all the members of the Football League met at the Grand Hotel Manchester to map out the post-war future of professional football in England. Sir Henry Norris was present representing Arsenal. Of course first the clubs had to agree formally to increase both the divisions to 22 clubs each: two extra places in Division One and two or more in Division Two (depending on how the Division I slots were filled). But even this was not that straightforward for a number of different proposals were put forward. Everton for example proposed that the League should not be expanded but that Chelsea should stay in the First Division and Manchester United (the match fixers who avoided relegation by fixing the game with Liverpool) should be relegated. (That seemed to be doing their rivals Liverpool a real favour since logic and honour suggested that both Liverpool and Man U should have been thrown out of the League totally for allowing match fixing to develop, given that there were now three matches that were known about in the match fixing list). But even relegation for the two guilty clubs was fiercely opposed not least because the clubs unified to blame the players. Their argument was carried because only representatives of the clubs were present, and everyone realised that they might be next. The footballers’ union had no say in the matter. But generally what the clubs were doing was protecting themselves in the future: the idea was that if further match fixing allegations arose this precedent would mean that the clubs would not be to blame; it would be the players. The directors effectively protected their own interests both at this moment in 1919 and (they hoped) forever more. By and large they were correct, although it took Leeds City a roundabout route to make use of the situation a little later, largely because in their case the directors were most obviously to blame for their misdemeanours. It was a decision that also caught Herbert Chapman in its net – although that matter was still a little way away in the future and we’ll come to it in time. But in essence, the view of the League was clearly set out. Whatever went wrong, it was not the fault of the directors. Only their employees could screw up. Every director who had ever done anything underhand must have been sighing a deep sigh of relief. All of this was incredibly important at the time because as we have seen there had been two other suspicious matches in the run up to the war, and no one wanted those matters brought up again. Next West Bromwich Albion proposed that the First Division be expanded to 21 teams and that Chelsea should be elected as the 21st team. This was rejected. It was finally agreed that both divisions would be expanded to 22 teams. Then it was agreed that Preston and Derby would be promoted (as would have happened even without expansion) and it was then agreed unanimously that Chelsea should be elected to the First Division. That left one position available for a promoted team and seven clubs had applied in advance for that final position so it was obvious that a vote was needed. Most of the applicants were as expected. Tottenham had finished bottom of the First Division in 1914-15. Barnsley, Wolverhampton, Birmingham City, Arsenal and Hull had finished 3rd to 7th in the Second Division and all applied. They were joined in the ballot with the surprise entrant: Nottingham Forest who had finished 18th in the Second Division! It has since been suggested in later reports that the Football League’s president made a speech supporting Arsenal. Other than secondary sources written some time later I’ve not seen anything to support this. The Sportsman, Athletic News, Daily Mirror and The Times all reporting the matter the following day certainly did not report this. They did report that C.E. Sutcliffe made a speech stating that the expansion would give them an opportunity to do right by Chelsea. It would seem strange if such a speech were made and somehow all the media failed to report it). As we can see above, besides West Ham, Coventry City, Rotherham County and South Shields were elected to the second division. The Athletic News reported that the Tottenham representative at the meeting stated “We shall take our defeat like sportsmen!” And in a sense they did, playing in Division II and immediately getting promotion back to the First Division after just one season. These figures show the average attendances for the clubs with the biggest average crowds. We compare 1913/14 with 1919/20 (rather than 1914/15) because the effect of the war on clubs in different parts of the country of playing during the first year of the war, when the League continued was dramatically different. The second column (“Div”) shows the division that each club was in across these three seasons. Thus Tottenham are shown in Division 1 for 1913/14, division 2 in 1919/20 and division 1 again in 1920/21. In each case the “Percent increase” is one year to the next. Chelsea was the only club to suffer a decline but this was largely due to their decline in position; they were 3rd in 1920 but 20th in 1921. Even Tottenham who dropped to the second division for the 1919/20 saw their attendance rise year after year. So, if matters were dealt with in an orderly fashion in the meeting, with Tottenham being very gentlemanly in accepting defeat and preparing their club (successfully it turns out) for one year in the second division, where on earth did all these stories about Arsenal bribing the chairmen come from. We shall look at this in the next episode.